The capital city of Telangana, Hyderabad is a popular tourist destination and presents its visitors with a mesmerising contrast of age old traditions, culture at one end and modern facilities, amenities of a metropolitan city at the other end. Hyderabad is one city, which has no dearth of tourist attractions. There are many tourism places to visit in Hyderabad, from families, young group of friends, children to senior citizens, everyone will find something of their interest in Hyderabad. This city is a place worth visiting at least once in a lifetime. In fact, it is impossible for anyone to soak in the multifarious charms which the city has to offer in a limited time span. Located on the banks of the Musi River, the city of Hyderabad was established in 1591 CE by Muhammad Quli Qutb Shahies. The city is noted for its unique culture, a lineage which can be traced back to the Asaf Jahi rulers, who were great patrons of literature, art,architecture, culture, jewelry collection and rich food. The moment you emerge from the Hyderabad airport, the city that immediately hits the eye is a sprawling metropolis of shopping malls, flyovers and office buildings with glass facades. And you are left wondering, where did the largest princely state of the Nawabs vanish? The city of Hyderabad depicts an interesting confluence of the traditional and the modern, the past and the present. So, don't feel betrayed by these inventions, synonymous of modernity as alongside the metropolis Hyderabad, also exists the Old City with an altogether unique charm of its own. Hyderabad can be divided into the historic city established by Muhammad Quli Qutb Shah on the southern side of the Musi River forms the Old City, while the New City encompasses the urbanised area on the northern banks. The Old City is composed of a maze of disorienting alleyways that expand outward from the Charminar. Most of the historical attractions are situated in the old city. One of the most important spot of Hyderabad sightseeing is the Charminar which was built in the year of 1591 by Mohammed Quli Qutb Shah who is refereed as the founder of Hyderabad. 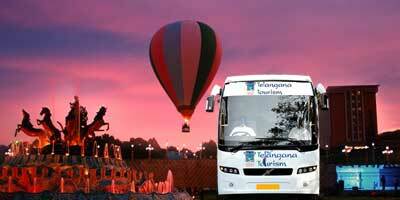 From monuments to museums to lakes to gardens to shopping complex, Hyderabad sightseeing consist almost everything. Historical monuments such as tombs of the legendary Qutb Shahi kings, Chow Mohalla Palace and Taramati Baradari, located at Ibrahimbagh are worth visiting. Sightseeing places such as Birla Mandir, Durgam Cheruvu, Chilkur Balaji Temple attract hordes of religious tourists from everywhere. There are various museum adding on to the list of Hyderabad sightseeing Places such as Salar Jung Museum, Nizam‘s Silver Jubilee Museum and AP State Archaeological Museum. Gardens such as NTR Gardens, Nehru Zoological Park, Lumbini Park, Sanjeevaiah Park are also quite popular amongst tourists and make for a perfect place for relaxing amidst slush greenery. The laser show at Lumbini Park is something worth watching. 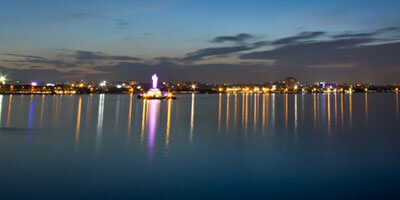 Hussainsagar Lake which was excavated in 1562 A.D. by Hussain Shah Wali, Osmansagar which is better known as Gandipet offer a good option of spending a relaxed evening by the side of refreshing water. Visiting Taramati Baradari Culture Village a popular place various kinds of event such as music concerts, performing arts, social events etc. is also a good idea. Shilparamam which is an Arts & Crafts Village is also a good place for some ethnic shopping. KBR National Park, Mrugavani National Park, Mahavir Harina Vanasthali National Park are located close by and important part of Hyderabad Sightseeing Places. 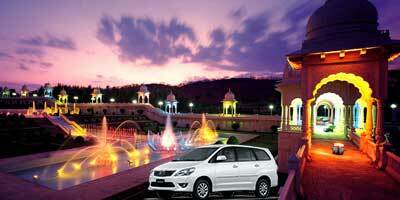 There are various Places to Visit in Hyderabad making your tour all the more enjoyable and interesting. When it comes to Hyderabad places to visit, the names that comes first in our mind is of the Charminar. Situated in the Old city, the Charminar has been built in the year of 1591 by Mohammed Quli Qutb Shah who is referred as the founder of Hyderabad. Another important visiting places of Hyderabad is the Golconda Fort. 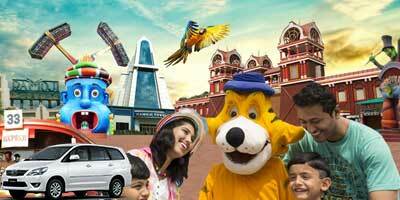 The city of Hyderabad offers its tourists with various historical places. Some of these are tombs of Qutb Shahi, Malwala Palace, Mecca Masjid, Purani Haveli, Paigah Tombs, Raymond Tomb, Chow Mohalla Palace and Taramati Baradari. For those looking for some spirituality, there are many religious places as well such as Birla Mandir, Durgam Cheruvu, Sanghi Temple and Chilkur Balaji. Museums also form an integral part of various places to visit in Hyderabad. Some of the popular museums to visit are Salar Jung Museum, Nizam‘s Silver Jubilee Museum and AP State Archaeological Museum, A P Archives and Research Institute, B M Birla Planetarium, B M Birla Science Museum, Cinema Ghar, Golconda Fort Archeological Museum, Health Museum, Jagdish and Kamala Mittal Museum, Numaish Exhibition, State Central Library and Sudharma. The city offers you with enough greenery and nature. for instances, parks such as NTR Gardens, Nehru Zoological Park, Lumbini Park, Sanjeevaiah Park, AnathaGiri Forest, Indira Park, Mahavir Harina Vanasthali National Park, Public Garden of Hyderabad, Botanical Garden (Kondapur) provide beautiful setting for relaxed moments. Along with these Hyderabad Places to Visit, Hussainsagar Lake and Osmansagar which is more popularly known as Gandipet also offer a refreshing setting in the middle of the city. 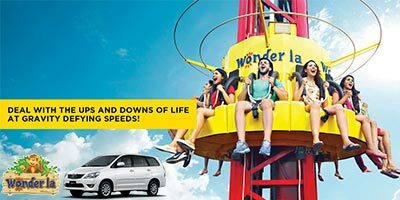 Ocean Park, Snow World, Mount Opera along with the famous Ramoji Film City along with Shilparamam are few other Hyderabad places to visit. However, as is the case, it is difficult to plan that long a holiday, so the best you can do is try and fit in as many tourist hotspots in your schedule as possible. So when planning a vacation to Hyderabad, chuck all the ideas of a laid-back vacation from your head and get ready to be on your toes the entire day as with an unending list of tourist attractions, you are bound to have a jam-packed itinerary, which we at Holidays DNA will help to chalk out for you. Lose yourself in the compelling charm of the Golconda Fort, capital of the Qutb Shahi kingdom. Where a shepherd boy once found a magic idol now stands a crumbling fort. Get caught in the tranquility of Mecca Masjid beneath the stars, one of the largest mosques in the world, which took 8,000 workers and 77 years to be completed. Partake the shahi experience of being a Hyderabadi Royal at Chowmahalla Palace, the seat of the Asaf Jahi dynasty where the Nizam entertained his official guests and royal visitors. While feasting on the haleem at Pista House, take you time to admire the iconic Charminar, located in the middle of a busy road with vehicular traffic. Shop for pearls and bangles in Laad Bazaar. Plan a picnic to Ramoji Film Studio, the largest integrated film studio of the world, as certified by the Guiness Records. A variety of things to do which Hyderabad has to offer. No visit to Hyderabad would be complete without a tasting of its culinary delights. Hyderabad is famous for its biryanis. There are no words to describe the taste of the Biryani, particularly at Paradise restaurant. Enjoy South Indian food items like dosa, idli and the rest at Chutneys restaurant. For sweets, do not miss the biscuits of Karachi bakery. We have said much about the delights which Hyderabad has to offer and the top and best places to visit in Hyderabad, its time now to choose from our holiday packages to Hyderabad to experience the delight on your own!